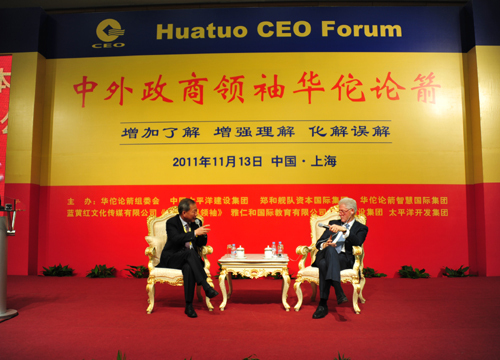 Yan Jiehe and US former president Bill Clinton are exchanging opinions at the Huatuo CEO Forum. Yan Jiehe is not only a shrewd entrepreneur, but also a disseminator of humanistic philosophy and wisdom. He is known for his bravery and directness, as well as his strong desire to pursue truth. Most importantly, he is a leader with a cautious outlook on management practices. In the post-financial crisis era, he expressed his confidence about the future of China's market economy. He also proposed that small and medium-sized enterprises (SMEs) in China should focus on their “math” and business management practices during development (i.e. to be bigger, better, stronger, and more excellent). In addition, he advises entrepreneurs who seek to internationalize to slow their pace before taking action. Q: You have been recognized as an entrepreneur with wisdom, we want to know your definition of a “financial crisis”. Would you share your opinions with us? A: What is a “financial crisis”? Crisis means trouble, but also new life. After a crisis, the economy will usher in a new situation. Only a country which develops significantly will encounter a crisis from time to time. A poor country never has a crisis. China has had no crisis before “reform and opening-up" policy implementations. South Korea encounters crises frequently, what about North Korea? None. The real estate sub-prime crisis triggered a financial crisis in 2008, but did not give rise to an economic crisis. Therefore, we should not worry about that for the US. Conversely, the global financial crisis is an opportunity for the Chinese economy. It provided an explosive growth in market share for Chinese enterprises from 2009-2010. Q: What do you think the impact of the global financial crisis had on China's economy? A: The 2008 financial crisis gradually became a relative economic crisis after its onset, and in some countries brought about political unstability. But the devastating impact on China's economy was not so large. The development of China's SMEs (small and medium-sized enterprises) today is determined by China's national conditions, and is relatively insulated from financial crises. In the 30 years of rapid development brought by economic reforms, we have become dominant in many industries around the world. Some areas even suffer from serious overcapacity. At the same time, energy consumption and pollution are very severe, so it's important to implement industrial improvements. In this sense, a lot of the problems encountered in the development of SMEs were a result of their own backwards production capacity and lack of innovation. It can not simply be attributed to the financial crisis. Macroeconomic data also supports my view. China's GDP grew by 9.5 percent in 2008, and the central fiscal revenue grew 19.5 percent. While developed economies suffered from stagnation or even negative growth, China achieved remarkable performance. It maintains that the Chinese economy as a whole is thriving. We cannot conclude that China is facing financial crisis or economic crisis simply because of the recession of SMEs and some foreign-funded enterprises. Why did the G2 Summit between USA and China get more attention than the G20 Summit? It shows that the Chinese economy in the context of the greater global financial crisis has been spared. Q: For the operation of SMEs in China, What are your suggestions? A: I think that SMEs must learn how to pursue moderate development first, that is, to be professional, specialized, proficient and excellent. Do not seek to expand your scale or quality, but seek to enhance the quality, brand influence and brand market share. Pursuing moderate development means that business operators should assess the situation and do the "math" of developing a strategy according to their operating environment. Addition is done to increase scale; subtraction is done for proficiency; multiplication is done for strong power and division is done for excellence. Many of our enterprises have not done the subtraction, which leads them to difficulties. If Pacific Construction Group did not do the subtraction in 2006 and 2007 it would not have developed the way it has. A storm or crisis is not a bad thing. It is time for us to do the subtraction, to slow down the pace or reduce surplus businesses in order to help enterprises develop healthier. Q: What should be Chinese enterprises pay attention to when developing an international strategy? A: The state encouraging that enterprises go abroad is definitely the right decision, but when we go abroad, we should be cautious. I remind the Chinese private entrepreneurs and state entrepreneurs to pay attention to the pace of going abroad. Look before you leap. Some foreign countries have implemented a market economy for 200 years. We have only had a real market economy for 20 years. We need to learn from their experience and lessons. Taking hasty action without caution will lead to problems. The acquisition of Volvo and the acquisition of IBM are costly lessons. A lesson itself is not horrible, but it's horrible if the lesson costs too severely. So take steps a little slower, ensure every step is steady, and be a little more mature. Q: From your point of view, what should be done to eliminate prejudice and misunderstanding of Chinese companies and brands in the international community? A: China has to deal with international public relations, and the international public relations of a country should be a responsibility of all the people in the country. Entrepreneurs can play an important role in this international exchange. On one occasion, a Taiwan pro-independence activist became silent after my speech at Harvard University, and on another occasion, a US anti-China activist immediately became speechless. This is because I let the data and facts speak for themselves. They were persuaded by me. In addition, we need to let the international community learn that the Chinese nation is a very great and intelligent nation. Let them see China’s history as the first imperialist nation and to not look down on China. Deng Xiaoping led China's reform and opening-up. China's economy is getting better and better. I really love my country and people. I understand that my country, my nation, China is the greatest in history.